From 360 South Turn Left on Heritage Pkwy. The Map show the park on the right side of 360. The Map has not been updated on yahoo maps or Google maps and they are wrong. 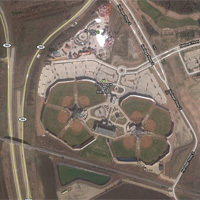 Click the satellite view and the park isn't built yet.